Dolce&Gabbana has launched its first ever cream eyeshadow line. The Italian brand chose to partner with the American actress once again to promote its first ever cream eyeshadow. Dolce & Gabbana, which has launched palettes of powder eyeshadows with two or four colors in the past, has introduced an entirely new product: a cream eye color available in single shades. The new Perfect Mono Intense Cream Eyeshadow was created in collaboration with makeup artist Pat McGrath. The new collection consists of 14 shades (eight matte and six pearl), all formulated with oils, silicone and silk elastomers for precise and easy application and up to 12 hours of wear. And just because this eyeshadow has a cream texture doesn't mean it can't be worn with powder products. "It's perfect by itself although adding a lighter tone from your favourite Eyeshadow Quad or Duo, or applying a pearl shade alongside a matte one will create extra drama," explains Pat McGrath. To give its new eyeshadow the campaign it deserves, the brand enlisted the help of one of its most loyal spokesmodels: Scarlett Johansson. "When we were looking for someone whose eyes embody the innermost essence of the Dolce & Gabbana woman, we could only think of one person: Scarlett. Her eyes can speak even when she does not," explained Domenico Dolce and Stefano Gabbana. Already the face of the Dolce & Gabbana fragrance The One, the actress is now also the star of a new makeup campaign shot by the fashion photography duo Mert and Marcus. 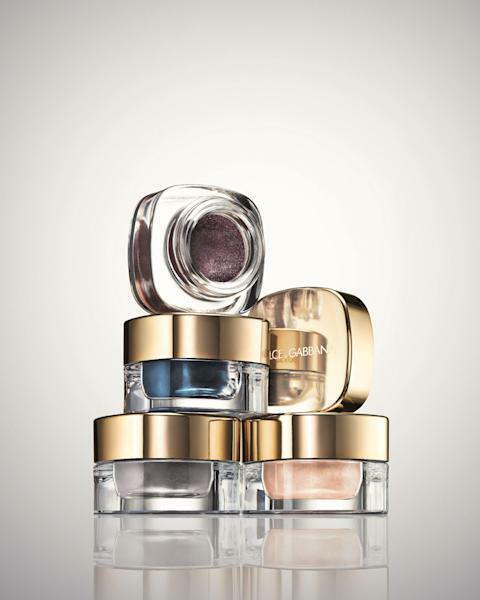 Dolce & Gabbana's Perfect Mono Intense Cream Eyeshadow will go on sale at select department stores this fall.